According to a study carried out by the Genetics, Physiology and Microbiology department of the Complutense University of Madrid (Spain), the HOGO rest system reduces a person's biological age by an average of 15 years. The preliminary conclusions show that in all the cases in which the volunteers rested in this bed their ageing rate was slowed down. The HOGO rest system both protects against electromagnetic pollution and clears it from the body, providing a space that is free from emissions, chemicals and non-natural elements. The research, led by Physiology Professor Monica De la Fuente and entitled "The effects on the immune system and biological clock of rest taken on natural materials, free from electromagnetic fields", was carried out for 60 days on 30 volunteers in a comparative study with some sleeping in the HOGO system and others in a standard bed, without any of them knowing which was which so as to prevent any placebo effect from affecting the results of the research. The study also revealed that the older the biological clock, the more possibilities there are of rejuvenating after resting in the HOGO system, which is what also appears to occur if the period is increased to six months. Moreover, the report stresses the ability of the HOGO system to enhance people's immune systems, particularly in aspects directly associated with a better state of health, and it concludes that they have less risk of suffering from illnesses and are better able to defend themselves from infections and cancers. As Professor Mónica De la Fuente points out: "The results are really positive and encouraging. This data shows that without having to make big changes to our life-styles it is possible to achieve a healthy long life." The HOGO rest system technology comprises a graphite and silver mesh surrounding the bed, linked to a ground connection that generates a natural bubble which helps the body to eliminate electromagnetic pollution built up during the day, while insulating the body from such pollution. 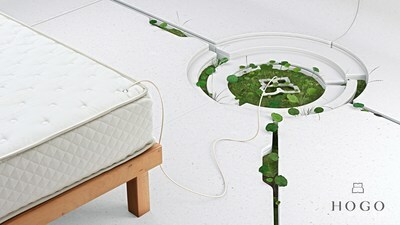 Moreover, this bed stands out from the rest on account of its natural, high-quality, sustainably manufactured materials. The mattress base support is made of flexible, resistant beechwood that adapts to the shape and weight of the body. Plus, the mattress has seven densities: pure natural latex, merino wool, coir fibre and cashmere, with the cover made of organic cotton. To arrange interviews with Professor De la Fuente: msimal@canelapr.com. HOGO is a rest system patented in Spain with the aim of enhancing life through rest. HOGO beds include unique technology that creates an atmosphere free from electromagnetic radiation. They are manufactured with high quality natural materials. The system is marketed worldwide and is particularly in demand from elite sports people, artistes and people who care about their health. Further information available at http://www.hogo.es .